Rev. 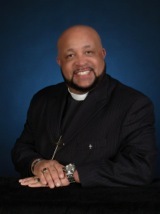 Beidleman is a native of Los Angeles California and has been part of African Methodism since birth. Rev. Beidleman has been married to Judy McKinley Beidleman for 26 years and has two daughters. He and his family were long time members of Brookins’ AME Church where he was active in various capacities. In 1997, Rev. Beidleman transferred his membership to New Philadelphia AME church where he served on the Trustee Board until accepting his calling. After successful completion of the Board of Examiners 5 year Program, Rev. Beidleman was ordained at the annual conference in 2009. Rev. Beidleman holds an MBA from Pepperdine University and is currently attending PayneTheological Seminary where he is working on his Masters of Divinity degree. Rev. has over 25 years in the Financial Services Industry and is currently a Senior Officer at a commercial bank headquarters here in Southern California. He also serves as an adjunct instructor at Cal State Dominguez, Los Angeles City College, and Los Angeles Southwest College. Rev. Beidleman enjoys serving his church, family, fellowship with his Masonic organization, camping, fishing and playing golf.